Repeatedly I am asked whether there is an association between inflammation and an enlarged prostrate. As many men age, inflammation of the prostrate increases its size, enlarging it and putting pressure on the urethra. (Although the prostate is enlarged, it is not a cancerous or fatal condition.) Why this occurs is still under investigation, but it appears to be a result of a combination of genetics, hormones and immune reactions. Men with prostate hyperplasia have lower urinary tract symptoms (LUTS) such as an urgent and frequent need to urinate (especially during the night), waiting longer than usual for the stream of urine to begin, straining to urinate, having a weak stream or dribble of urine, not being able to completely empty one’s bladder, or needing to urinate immediately and having an “accident”. Obesity leads to greater over-all inflammation and puts overweight people at higher risk of having prostrate and urinary tract disorders. Obese men are 3.5 times more likely to have enlarged prostrates compared with men of healthier weights. The more weight a man carries, the more inflamed he is, the higher the risk of cardiovascular disease and diabetes as well. The relationship of an enlarged prostrate to diabetes remains controversial. Diabetes has been associated with bladder problems and the ability to control urination. Additionally, the higher the level of sugar in the blood, the more likelihood of urinary problems and enlarged prostrates, especially in men that do not take medications for their diabetes. However, since both diabetes and benign prostate hyperplasia are inflammatory in nature and are clinically similar it is not clear whether the two diseases are associated. 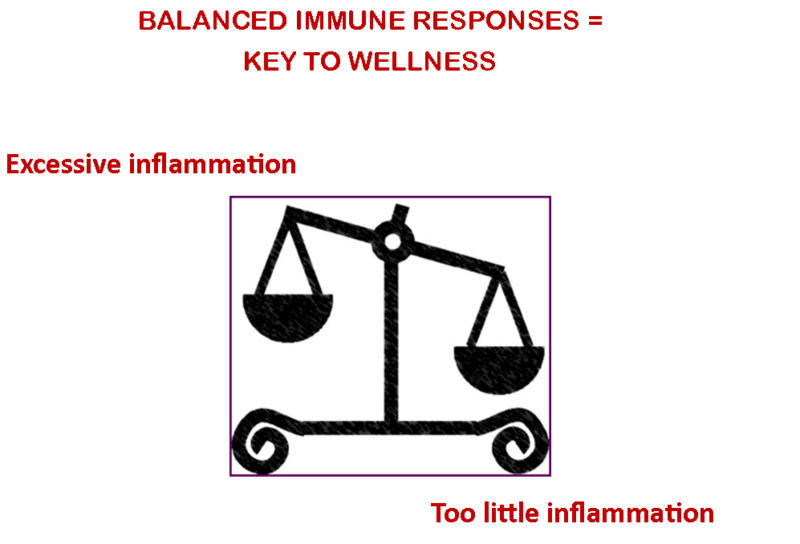 Inflammation is tightly controlled to keep it balanced, in homeostasis. We need enough inflammation for healing and for defending us from infections, but not so much inflammation that organs and tissues are damaged. Being active, controlling one’s weight, going outdoors for a few minutes a day and using a proven immune balancing supplement will greatly affect the ability of the body to modulate inflammation. For years I have helped people promote their overall quality of life. Feel free to contact me DrHellen@DrHellenGreenblatt.info, use the form, or give me a call at 302.265.3870 (ET) and let us talk. Let me help you help yourself, you deserve it. Good Nutrition is Not Enough. The Need for Balanced Inflammation. Last week I talked with a young local Asian-American business owner who shared with me that he was “a little fatigued and stressed out”. I suggested that if he took steps to getting his immune system in balance, that since our physical and emotional well-being is dependent on homeostasis, he would feel much better. He basically replied that, “he spends half the year in Florida, has a lot of friends that are “into” nutrition, he exercises and that he didn’t need any more information, thank you”. Nothing like a person with an open mind, but unfortunately too many people think in this narrow way. We all know individuals that eat nutritiously, exercise 5-7 days a week and watch their weight but they still do feel “off”. Their fingers, elbows or knees hurt, they can’t eat everything they would like, or they have other health issues despite their “great” life style. The evidence is strong that due to the hundreds of phytonutrients, plant nutrients, in fruits, vegetables, nuts, beans, whole grains and olive oil, that plant-based foods are important for our health. A broad variety of these phytonutrients are suggested since they appear to affect a wide-spectrum of biological functions. The consumption of plant-based foods influences the health of cells, blood pressure, risk of certain cancers, immune, dental, urinary, liver and gut health. An additional dietary recommendation is to consume fish or fish oil 2-3 times a week for their omega-3 fatty acids. This “good” fat has multiple uses in our body, but the body cannot produced these fats by itself; we need an outside source. When the body is threatened by pathogens or cancer cells, or has been injured, the body responds with short-term inflammatory responses, acute inflammation. Immune cells flood the area to destroy invading foreign organisms or cancer cells, or to start the healing process after trauma. If the body cannot get rid itself of the infection, or if it over-responds with excessive levels of inflammation, the immune response may become chronic, or long-term. Chronic inflammation is abnormal and damages previously healthy tissues and organs. This sort of unlimited inflammation results in autoimmune diseases, diseases in which the body’s immune system turns on the body. Conditions such as arthritis, diabetes, lupus, multiple sclerosis, Crohn’s disease, ulcerative colitis, celiac disease, hepatitis and asthma can result from such run-away inflammatory responses. Knowledgeable individuals know that nutrition plays only an initial role in staying healthy. Good nutrition is the foundation upon which to build health, but it is NOT ENOUGH; it is the immune system that governs one’s health and must be optimized. Immune balance, immune homeostasis, is tightly regulated by the body. It allows the organism to respond to infection, cancer cells and injury with the right amount of inflammation. Any imbalances, either too much stimulation, or too little, results in immune disorders and health issues. The key to good health and healthy aging is keeping the immune system in balance. Dr.Hellen’s major passion is helping people to enjoy life at its fullest. She may be contacted by using this form, at: drhellen@drhellengreenblatt.info or feel free to call: 302.265.3870 (ET, USA). Expecting to Live Longer? Balance Inflammation. For over two decades I have noticed that individuals in immune homeostasis, immune balance, are on fewer medications or no medications than their cohorts, and the majority of them look and feel 10 years younger than other people their age. Comparing photos of how these individuals look now with photos as how they looked 10-20 years ago, it is amazing how great they look! Their youthfulness is especially apparent when I compare these photos to those of individuals that have not made the effort to control inflammation. Too many older individuals suffer from chronic inflammatory diseases such as arthritis, diabetes, cognition deficits, Parkinson’s disease, lung, kidney, and bladder problems. Over the years there have been numerous studies associating chronic (long-term) inflammation with the development of mutating cells and cancers. However because of the time it takes to do longevity studies it is difficult to prove that limiting inflammation makes a difference in how well people age. Just this month, a team of scientists from Keio University School of Medicine, Tokyo, Japan and the Newcastle University’s Institute for Ageing in the UK published a study of the immune status of over 1500 individuals ranging in age from 100-115 years. The study group was divided into two: centenarians, 100-104 years of age, and semi-supercentenarians aged 105 and above. The result was that these long-lived individuals had lower levels of inflammation as compared to the general public. As I have pointed out for decades, controlling the delicate balance of inflammatory responses, i.e., achieving immune homeostasis, makes all the difference in one’s youthfulness and quality of life. P.S. My post of May 20, 2013 also discusses the role of inflammation in longevity. Please contact me directly if you would like to learn simple approaches to making a difference in your health.